The life and death of any housing market depends on the support of the credit markets. While there is no end of media coverage dealing with rising housing prices and household debt levels, the most important developments take place in the credit markets when it comes to discerning the direction of housing. To begin with, let’s look at the money supply growth in Canada. The change in the growth rate of the money supply is flashing a warning sign that growth will be damped considerably. Money supply growth turned negative in the spring/summer of 2018 and fell to 5.1% – down about 11% from the same period in 2017. The number is well below its 10-year trend line annual growth of 7.5% (Figure 1). The Bank of Canada has always maintained that M1+ provides a major indicator of economy well-being and any slow down in money supply growth must not be ignored. 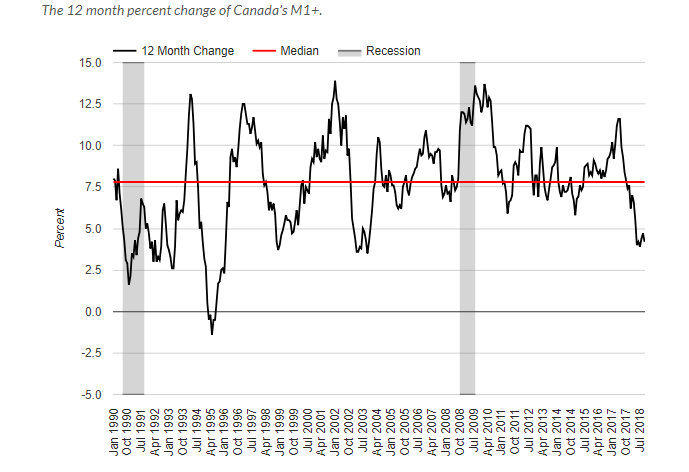 The growth rate of Canada’s M1+ is near one of the lowest levels in two decades. This decline in money supply growth sets the stage for a future decline in credit availability, the foundation of housing expansion. Turning next to the mortgage market, mortgage credit in Canada has declined significantly in the past year. (Figure 2). 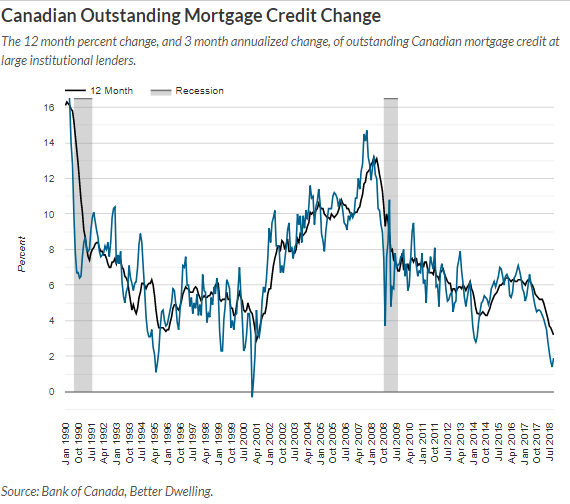 The low growth of Canadian mortgage credit is on pace to fall even further in 2019. Currently, the market is displaying an annual growth rate of 2 %. For this trend to revert to the levels of the previous 5 years there would have to be a massive spike upward in new mortgage underwriting starting this winter. As with any market in decline, there is always the concern about adequate liquidity. To this end, it is very telling that the Bank of Canada announced their intention to buy Canada mortgage bonds starting in November 2018 and continuing into 2019. The Bank claims we should not read anything into this other than it is a “balance sheet adjustment”. Clearly, they are worried about possible illiquidity down the road. What lies behind the slow down in mortgage credit? The Bank of Canada and related regulatory bodies have made no bones about their concern with rising homes prices, especially in the Greater Toronto and Vancouver areas, and to a lesser extent in Montreal. The media has been replete with articles about a possible housing bubble. A whole of set of new mortgage rules, introduced in 2018, makes it harder to qualify for mortgages, especially for first-time purchasers. The commercial banks, who account for 75% of all home mortgages, are concerned with their over-exposure to mortgages and are voluntarily easing up on new underwritings. Finally, the Bank of Canada has indicated that future rate hikes are to expected. One wonders, given the stress in the financial markets in December, whether the Bank will continue to raise rates as promised. Dreadful charts, Prof. Rollover mortgages must be terrifying for many. It is starting to hurt. I have heard of many mortgage brokers leaving the industry because they cannot service clients. At some point the authorities are going to have to relent on the rules. The worse rule is a new borrower has to show ability to carry a mortgage at 200 bps above the posted Bank of Canada rate for mortgages and that rate is already above the market. An example of bureaucrats not understanding the market they regulate. I received undergraduate and graduate degrees in economics and finance from the University of California, Los Angeles, 1968. My professional expertise is in macro-economics; currency and trade strategies; interest rates and yield curve analysis and fixed income strategies. For the past two decades I advised an independent brokerage firm on capital markets, and yield curve analysis and portfolio management. Prior to that, I worked as senior consultant, with Peat Marwick and Partners (PMP) and A.R.A Consultants, responsible for projects in infrastructure, industrial strategy and public finance. From 1972 to 1980, I was Director of Research at C.D. Howe Institute, overseeing research in Canada-US trade, currency developments, and Canadian monetary policies.